DBK-USA specializes in manufacturing PTC (Positive Temperature Coefficient) heating elements. These heaters are made from a combination of two semiconductor materials–Titanium and Barium. The chemical composition is designed to cause the material’s surface temperature to rise as electrical current flows through it. During this initial phase of applying electricity, the resistive nature of the compound’s crystal structure rises exponentially, causing the current’s flow to eventually slow to a trickle. With no electrical current flowing, there is no additional heat generated within the semiconductor’s surface. This chemical structure produces a self-regulating PTC heater. 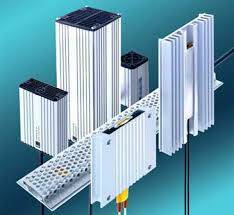 The crystalline structure of each compound within the heater is engineered to start generating resistance and heat again when the surface temperature falls below a specific minimum temperature level. The PTC heating elements are designed to achieve and regulate operating temperatures in 10 degree intervals with a minimum of 40 deg C/104 deg F and a maximum of 220 deg C/428 deg F.
DBK Cirrus Range Forced Convection Heaters are safe PTC based dynamic self-regulating heaters. These heaters are available in 5 to 800 wattages with voltage ranges available from 12/24VDC to 115/230VAC. With an excellent power to size ratio, these forced convection heaters also come with an independent fan circuit to help with air circulation. All Cirrus heaters have UL, VDE and CSA approvals. Call Jobco about DBK product questions, special promotions and quantity discounts at 479-424-1300. Fgc0004.2r Cirrus 25/1 Forced Fan Convection Heater With 5 Watts Of Power, 12 Volts And A 12 Vdc Fan. This Heater Also Comes With A Standard 600mm (23.6 Inches) Lead With Din Clip And Outlet Finger Guard. Fgc0017.2r Cirrus 25/1 Forced Fan Convection Heater With 10 Watts Of Power, 24 Volts And A 24 Vac/dc Fan. This Heater Also Comes With A Standard 600mm (23.6 Inches) Lead With Din Clip And Outlet Finger Guard. Fgc0005.2r Cirrus 25/1 Forced Fan Convection Heater With 20 Watts Of Power, 12 Volts And A 12 Vdc Fan. This Heater Also Comes With A Standard 600mm (23.6 Inches) Lead With Din Clip And Outlet Finger Guard. Fgc0018.2r Cirrus 25/1 Forced Fan Convection Heater With 20 Watts Of Power, 24 Volts And A 24 Vac/dc Fan. This Heater Also Comes With A Standard 600mm (23.6 Inches) Lead With Din Clip And Outlet Finger Guard. Fgc0002.2r Cirrus 25/1 Forced Fan Convection Heater With 5 Watts Of Power, 12 Volts And A 12 Vdc Fan. This Heater Also Comes With A Standard 600mm (23.6 Inches) Lead With Din Clip And Outlet Finger Guard. Fgc0015.2r Cirrus 25/1 Forced Fan Convection Heater With 5 Watts Of Power, 24 Volts And A 24 Vac/dc Fan. This Heater Also Comes With A Standard 600mm (23.6 Inches) Lead With Din Clip And Outlet Finger Guard. Fgc0521.2r Cirrus 25/2 Forced Fan Convection Heater With 10 Watts Of Power, 24 Volts And A 24vac/dc Fan. This Heater Also Comes With A Standard 600mm (23.6 Inches) Lead With Din Clip And Outlet Finger Guard. Fgc0504.2r Cirrus 25/2 Forced Fan Convection Heater With 20 Watts Of Power, 115/230 Volts And A 12 Vdc Fan. This Heater Also Comes With A Standard 600mm (23.6 Inches) Lead With Din Clip And Outlet Finger Guard. Fgc0501.2r Cirrus 25/2 Forced Fan Convection Heater With 20 Watts Of Power, 12 Volts And A 12 Vdc Fan. This Heater Also Comes With A Standard 600mm (23.6 Inches) Lead With Din Clip And Outlet Finger Guard. Fgc0505.2r Cirrus 25/2 Forced Fan Convection Heater With 30 Watts Of Power, 115/230 Volts And A 12 Vdc Fan. This Heater Also Comes With A Standard 600mm (23.6 Inches) Lead With Din Clip And Outlet Finger Guard. Fgc0502.2r Cirrus 25/2 Forced Fan Convection Heater With 30 Watts Of Power, 12 Volts And A 12 Vdc Fan. This Heater Also Comes With A Standard 600mm (23.6 Inches) Lead With Din Clip And Outlet Finger Guard. Fgc0523.2r Cirrus 25/2 Forced Fan Convection Heater With 30 Watts Of Power, 24 Volts And A 24vac/dc Fan. This Heater Also Comes With A Standard 600mm (23.6 Inches) Lead With Din Clip And Outlet Finger Guard. Fgc0506.2r Cirrus 25/2 Forced Fan Convection Heater With 40 Watts Of Power, 115/230 Volts And A 12 Vdc Fan. This Heater Also Comes With A Standard 600mm (23.6 Inches) Lead With Din Clip And Outlet Finger Guard. Fgc0503.2r Cirrus 25/2 Forced Fan Convection Heater With 40 Watts Of Power, 12 Volts And A 12 Vdc Fan. This Heater Also Comes With A Standard 600mm (23.6 Inches) Lead With Din Clip And Outlet Finger Guard. Have a question? Don’t see what you’re looking for? Call us at (479) 424-1300 or send us a message!